Molly started teaching fly-casting back in the 80’s after she left the Midwest and landed in Utah. In 2000, Molly and her family moved to Livingston Montana where she began a 15-year guiding/outfitting career. 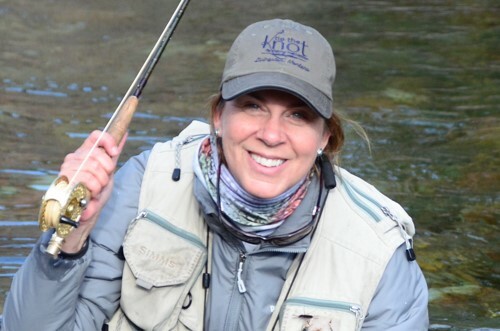 During this time, Molly started Tie The Knot Fly Fishing, became an outfitter and Master Certified Casting Instructor through the International Federation of Fly Fishers now the Fly Fishers International. Another move took her further west to Birch Bay Washington. A Two-Handed fly rod is now her go to method in the PNW. Molly is currently on the Casting Board of Governors and Board of Directors of the FFI. Along with casting instruction and women’s destination travel, Molly gives programs on her book titled 25 Best Off-the-Beaten Path Montana Fly Fishing Streams by Stonefly Press (2017 Bronze Award winner through the Independent Publisher Book Award).